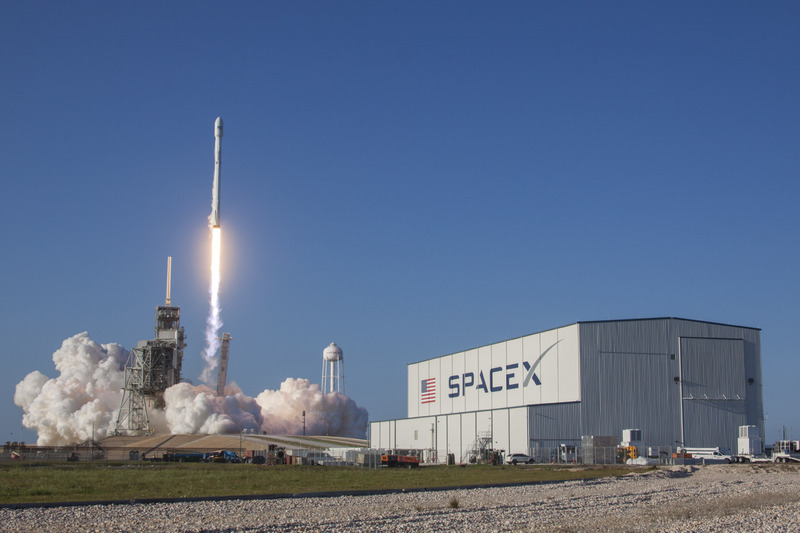 With a feat 15 years in the making, SpaceX cemented its position as a trailblazer in commercial spaceflight on Thursday, lifting the company’s re-use aspirations to a new level by sending a booster on its second trip into space and back. The ‘flight-proven’ booster had helped lift SpaceX’s Dragon spacecraft into orbit back in April 2016 and was tasked on Thursday with giving the SES-10 commercial communications satellite a ride to a high-energy orbit. 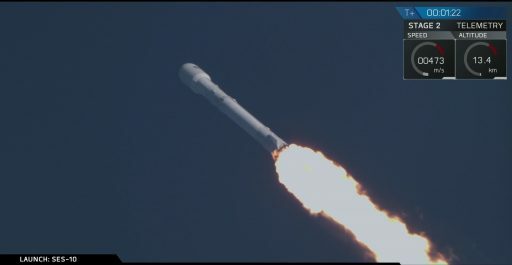 Falcon 9 blasted off from Cape Canaveral’s Launch Complex 39A at 22:27 UTC, aiming for a place in the history books by becoming the first orbital-class launch vehicle to successfully re-fly a first stage. After flawless performance by the veteran booster, Falcon’s upper stage was tasked with a pair of firings to send the heavy SES-10 satellite into Geostationary Transfer Orbit. 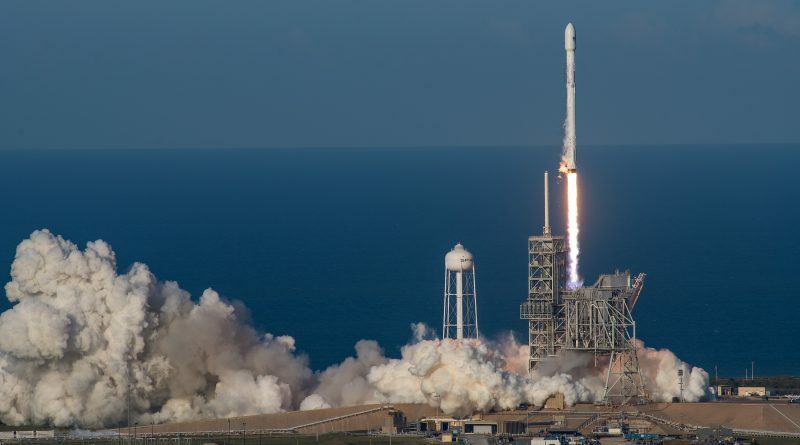 Springs pushed the satellite away from the rocket 32 minutes after launch to mark the first successful orbital delivery by a re-flown Falcon 9 rocket. After sending the second stage on its way, the Falcon 9 first stage geared up for its second return journey from the edge of space, this time coming in much hotter than on its the first mission given the energies involved in a GTO delivery. Proving the robustness of SpaceX’s rockets, the booster fired its engines to hit the brakes for re-entry, used its actuated fins to guide itself to the Autonomous Spaceport Drone Ship and re-lit its center engine to come to a successful landing on its four fold-out legs. In true SpaceX-style, the company not only demonstrated flying a used rocket stage but also used Thursday’s mission for the first experimental return of Falcon’s payload fairing – the next step in SpaceX’s master plan of reducing the cost of sending payloads into orbit. Following their role of protecting SES-10 during atmospheric climb, the two fairing halves fell away from the rocket four minutes into the mission and were set to deploy auto-steering parachutes for a pin-point landing in the ocean. Elon Musk said the recovery was a success after seeing a photo of an intact fairing half floating in the Atlantic. Although Thursday’s re-flight and re-landing are of historic significance, SpaceX still faces the challenge of making re-flight missions routine over dozens of flight cycles for each booster – potentially representing an even greater feat to achieve. 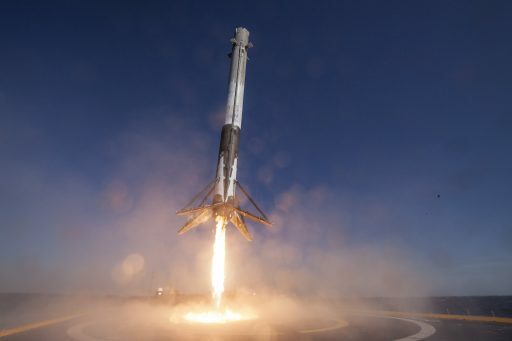 Thursday’s mission came nearly a full year after the booster’s first flight assignment; SpaceX plans to eventually cut the turnaround to under 24 hours to reduce the cost of launching satellites by up to a third, but the company admits it is still several years away from routine and rapid re-use. 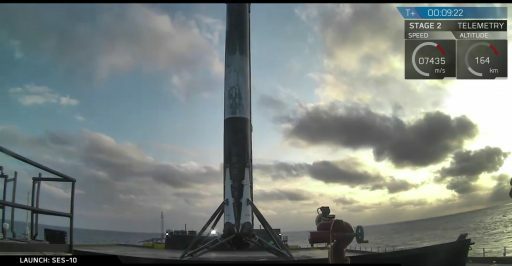 Elon Musk said after Thursday’s successful mission that up to six re-flights of Falcon 9 boosters could occur this year – three or four on Falcon 9 missions and the debut launch of the tri-core Falcon Heavy will feature a pair of side boosters that flew solo on two previous Falcon 9 missions. 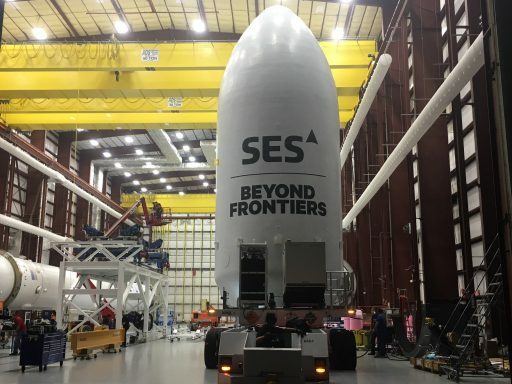 SES said the company may opt to put two of three of its satellites manifested on Falcon 9 this year on flight-proven vehicles. Musk expects re-flight to become commercially viable in 2018 with up to a dozen re-use missions, repaying SpaceX for the expenses incurred during the lengthy development program of the reusable Falcon 9. SpaceX’s re-use aspirations are rooted deep in the company’s history as Elon Musk set SpaceX on a path toward the colonization of Mars ever since the firm was founded in 2002. Rapid and cost-effective re-use is a major technological step on Musk’s Mars vision with a first goal of making orbital space launches more affordable through implementation of partially reusable launch vehicles. Initially, SpaceX planned to drop rocket stages into the ocean suspended under parachutes, but after some testing, plans were revised toward a powered recovery architecture with first stage boosters using their engines to land in an upright position – either on land or at sea using SpaceX’s Autonomous Spaceport Drone Ship. Beginning in 2011, the company’s Grasshopper and F9R Dev testbeds explored the low-speed regime of the landing sequence with ever-increasing hops carried out in Texas while operational Falcon 9 boosters demonstrated they could survive re-entry and maneuver with great precision to splashdown location in the ocean. 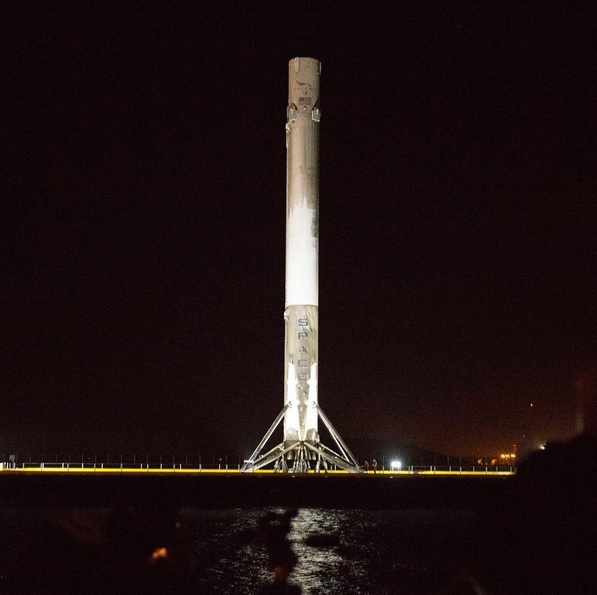 Introducing the upgraded Falcon 9 with more powerful engines, four fold-out landing legs and steering fins at the top of the booster, SpaceX had all the tools for regularly returning first stages from the edge of space toward a landing on land or at sea. 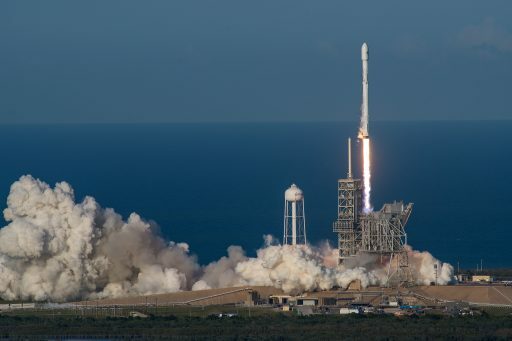 SpaceX recovered its first stage in December 2015 when Falcon 9 made a thundering nighttime liftoff from Cape Canaveral only to return to Florida’s Space Coast with the same thunder and sonic booms eight minutes later, in the process dispatching a group of Orbcomm satellites to orbit. 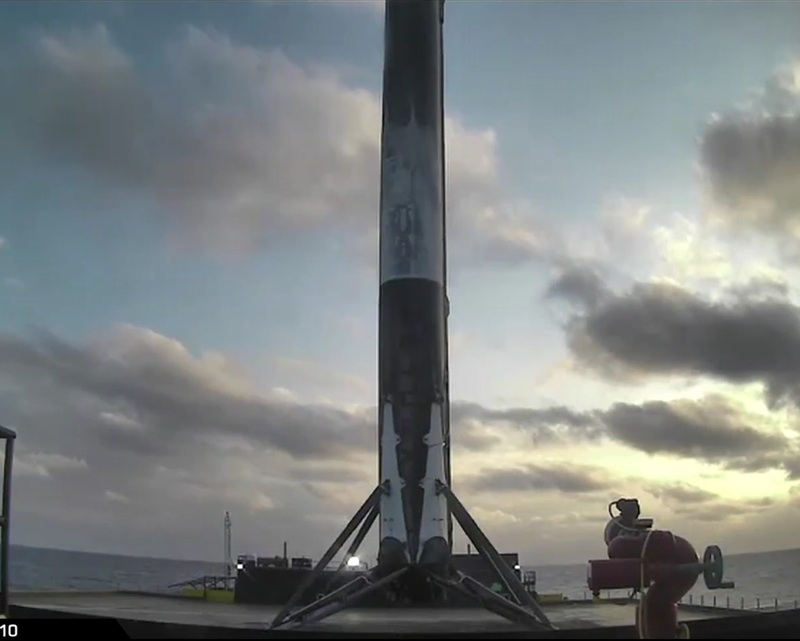 Mastering the landing on the drone ship proved to be more difficult, starting with a string of four failures that delivered valuable data and ultimately enabled Falcon 9 to establish a remarkable success rate – even higher than SpaceX had envisioned. The booster stage re-flown on Thursday is identified by serial number B1021 with a history of active duty dating back to February 2016 when the integrated stage went through its first acceptance test at SpaceX’s Texas site followed by shipment to Cape Canaveral. B1021 soared to the edge of space and back for the first time on April 8, 2016 giving SpaceX’s Dragon SpX-8 cargo craft a boost toward the International Space Station. After its role in the primary mission, the booster became the first to stick a landing on the Drone Ship. Although a land-based recovery was possible for the flight, SpaceX wanted to have a high-margin drone ship attempt to finally stand a landing after four close calls. B1021 made a triumphant return to Port Canaveral a few days after launch and then underwent four months of refurbishment and detailed inspections to verify it was ready for the rigors of a second flight into space. Satellite operator SES committed to becoming the first company to ride on a flight-proven rocket in August 2016 and both SpaceX and SES convinced insurers that B1021 was as good as a newly produced first stage. SES was also given a discount of around 10% off Falcon’s normal launch price, but the company said the move was purely strategic to get the first re-flight mission off the ground as quickly as possible. Falcon 9 enjoyed a remarkably smooth launch countdown on Thursday, coming just two weeks after Launch Complex 39A had seen off the EchoStar-23 satellite launching atop an expendable Falcon 9. Earlier in the day, there had been concerns that the SES-10 satellite would not be able to finish checkouts once reaching its launch position atop the Falcon 9 rocket, but that work quickly jumped ahead of the timeline and the rocket’s countdown itself proceeded by the book, first going through several hours of vehicle checks. The propellant loading sequence kicked off at T-70 minutes under the close watch of controllers in two Launch Control Rooms at the Cape, including SpaceX CEO Elon Musk. 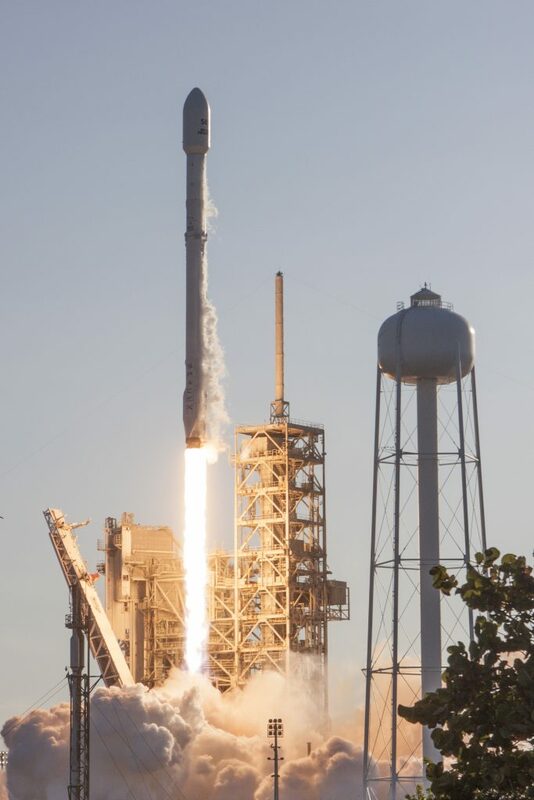 Over the course of the multi-step tanking sequence, Falcon 9 received over 500 metric tons of sub-cooled Liquid Oxygen at -207°C and chilled Rocket Propellant 1 at -7°C, a densified propellant mix to enhance the rocket’s performance by fitting a greater prop mass into the limited tank volume. SES-10 switched to battery power and Falcon 9 entered an extremely busy sequence of steps to transition to its autonomous launch configuration. The launcher exercised the various engine mixture valves, tested its thrust vector control system, switched to battery power, and armed the new Autonomous Flight Safety System – all while propellants were still being loaded into the two-stage stack. Tanking wrapped up right at the T-2 minute mark and Falcon 9 was handed full control of the countdown one minute later to gear up for the final pressurization of tanks and engine ignition. Booster #1021 came alive three seconds prior to T-0 as its nine Merlin engines began breathing fire to soar up to a total thrust of nearly 700 metric-ton-force to lift Falcon 9 off the ground. Falcon 9 was released at 22:27 UTC, 6:27 p.m. local time and rose vertically from its launch pad against the backdrop of the low-hanging sun, thundering off on a momentous mission for SpaceX. 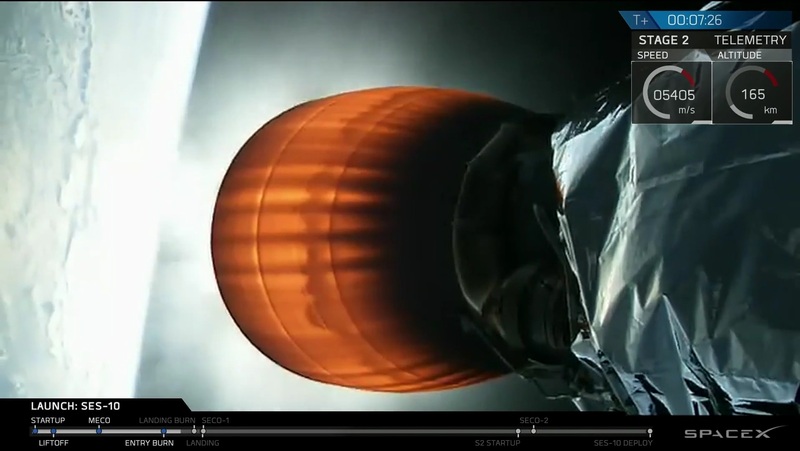 Burning 2,500 Kilograms of propellant per second, Falcon 9 began accelerating downrange, taking the standard south-easterly path to Geostationary Transfer Orbit. The rocket pushed though the sound barrier just over one minute into the flight and the moment of Maximum Dynamic Pressure came at T+82 seconds when stress on the rocket’s first stage reached a peak – a point in the flight many held their breath for as it placed the most pressure on the booster’s used air frame. Falcon 9 throttled back briefly around MaxQ before continuing full steam ahead toward its cutoff target. Shutdown of the nine Merlin engines on the first stage came two minutes and 38 seconds into the flight at an altitude of 64 Kilometers after the booster accelerated the stack to a speed of 2,290 meters per second or nearly seven times the speed of sound. Three seconds after MECO, pneumatic pushers sent the first stage clear of the MVac upper stage engine to assume control of the primary mission with an initial burn to achieve Low Earth Orbit. Stage 2 fired up eight seconds after staging and its ignition was captured in spectacular fashion from the first stage which embarked on its second return from the edge of space. 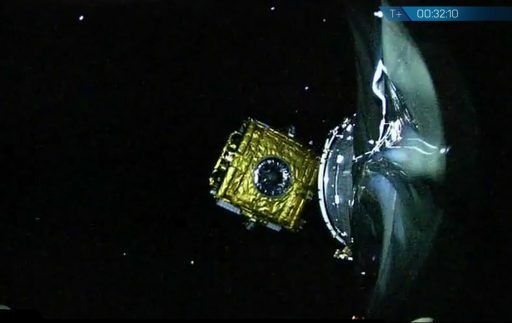 Lifting the 5,300-Kilogram SES-10 satellite toward GTO left the first stage with a very small propellant reserve to hit the brakes prior to entry and manage a powered landing on the Drone Ship which held a precise position in the ocean, 550km from LC-39A. Onboard video from the first stage showed the booster swinging around to a tail-first position before firing up a subset of its engines at T+6 minutes and 24 seconds for a 20-second braking maneuver to slow down for re-entry. When the burn finished, Stage 1 made a quick pitch-up and the heat of re-entry became evident as flames built up around the four deployed grid fins and the camera view was blackened significantly. Over the course of 80 seconds of atmospheric descent, Stage 1 used its actuated fins to fine-tune its approach to the drone ship prior to firing up its center engine just after the T+8 minute mark for the final landing burn. The half-minute landing burn was to involve some heavy throttling to set the booster down on the four landing legs that folded into place moments before contact with the ship. 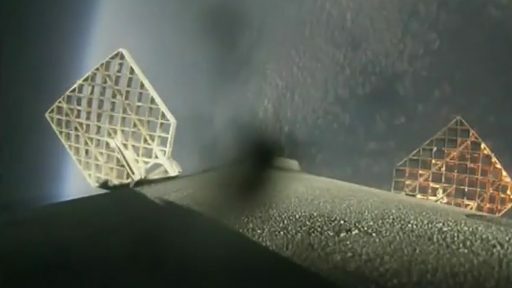 Video from the first stage and drone ship vanished before landing, but landing controllers had telemetry data to call out a successful landing, the second for B1021 and quickly confirmed visually when TV signals returned and showed the booster in remarkable shape, aside from the typical blackening of its skin. The second re-use element of Thursday’s mission came into play three minutes and 49 seconds into the flight when the 13-meter long payload fairing halves fell away from the rocket to shed no-longer-needed weight and reveal the SES-10 satellite for the rest of its journey. SpaceX was known to be working on a way to recover the payload fairing halves as they represent around 10% of the rocket’s manufacturing cost. Thursday’s mission was an experimental fairing return, using thrusters to stabilize the fairing halves for re-entry before deploying auto-steering chutes to deliver them to a precise landing point. Musk said at least one half had come back intact based on photos he had been shown. Future fairing returns may use an aerial recovery and Musk also confirmed the existence of a robotic tool for the Drone Ship that will be implemented in the coming months to remotely secure a first stage on the ASDS. Just as the first stage was on final descent toward the drone ship, Stage 2 reached orbit and shut down its engine eight minutes and 33 seconds into the flight for 18 minutes of coasting. Over the course of the coast, the second stage continued its south-easterly trek across the Atlantic in order to reach the equator for the second burn to set up the typical insertion parameters for a Geotransfer Orbit. Re-light of the 95,000-Kilogram-force MVac was confirmed after passing the T+26-minute mark and the engine was to burn for 53 seconds to accelerate the stack by around two Kilometers per second, aiming for an orbit of 220 by 35,400 Kilometers at a slightly reduced inclination of 26.2 degrees. Guidance controllers reported Falcon 9 achieved a good orbit and live video from the rocket showed the SES-10 satellite drifting away from the second stage 32 minutes after liftoff. 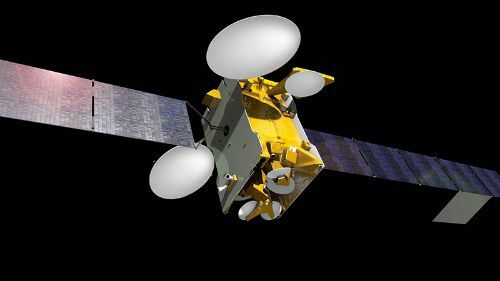 SES-10, built by Airbus Defence and Space in Europe, will replace a pair of satellites launched in the late 1990s and enable SES to offer Ultra-HD television services to Mexico, South and Central America as well as the Caribbean via 50 high-power Ku-Band transponders. The satellite is considered an important part of the expansion of SES satellite services into UHD markets. SES-10 will circularize its orbit in the first half of April and take up station at 67° West where it will complete four weeks of testing before being placed in active duty for what is expected to be a 15-year mission. 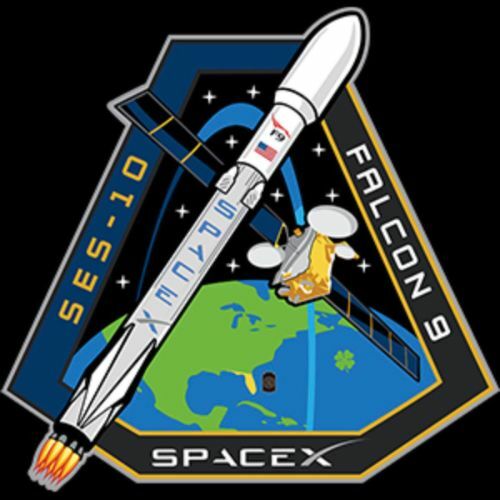 Copyright © 2019 Falcon 9 – SES-10. All rights reserved.